Unlike today (in a large part of the western world, at least), the failure of the crops or milk supply in any community would have had a very serious and immediate impact indeed; the failure of the crops, disease of livestock or failure of the milk to come would have been devastating either in combination or on their own. Famine was a very real threat and the surviving lore associated with everyday activities such as milking, churning butter and making cheese, the making of the bannocks and the traditional preparation of the Bealltainn feast of a freshly killed male lamb “without spot or blemish”5 is testament to this. Transhumance is no longer practiced in Ireland, Scotland, and Man, except in one notable instance (as far as it’s been reported…). While many of the traditions associated with Bealltainn are obviously influenced by, or rooted in, this way of life and may not necessarily be relevant to the way most of us live today, this doesn’t mean that they’re irrelevant. Where we may not be able to replicate, we can adapt. So it’s with this in mind that we can look at the historical evidence and work from there. “BIL from Bial i.e. an idol god, unde beltine ‘May day’ i.e. fire of Bel. 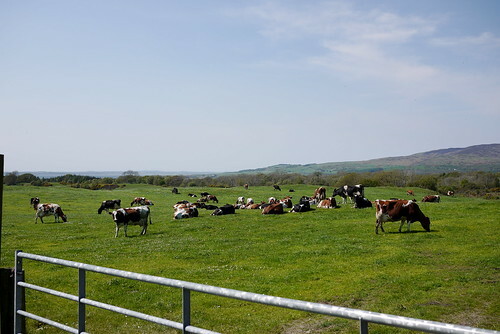 Another etymology suggests that rather than -tene, “fire”, the second element of the word is –dine, meaning newborn cattle, thus referring to the calves that were sacrificed the Bel.14 Irish legal commentary refers to Bealltainn as being the start of the calving season – lulgachus Beltaine, or ‘May calving’15 – which could lend credence to the suggestion, but with the overwhelming fiery focal point to the ceremonies from the earliest sources onwards, the most obvious explanation is the one that’s most likely to be correct. Although the weather might still have been a little on the unpredictable side in early May – especially in the more northerly parts of Scotland – there came a point when the sheep and cattle would have to be moved to the hills to take advantage of the new grass that was available. There was a trade-off to be had between risking losing some livestock to bad weather and enduring the miserable cold and wet of a late start to the summer and getting to the hills while the fields were starting to grow again, so that the cattle could condition the fields and discourage the undesirable plants and weeds from gaining too much of a hold amongst the grass. In marshes and in rocky ground. To seek and search for you. To protect you and to herd you. These concerns are again seen in the rites of the day, with livestock and land being sained to protect against unseen dangers, and offerings being made to keep predators away. The fires mentioned in Cormac’s Glossary were a common feature of both Irish and Scottish festivities, but most records of them survive as anecdotes and memories of a tradition that had already died out, or else had not been witnessed first hand by the author. Sources of this age rarely give references as to where they got their information from, unless giving a direct quote, so it’s difficult to ascertain the accuracy of Stewart’s claims regarding the ingredients used in purifying the sheep, since there was often a tendency to fill bits in from sources that would be considered out of context. Juniper is known to have been used in saining rites at other times, however, so there seems to be no reason to doubt him. “…But since the decline of superstition, it has been celebrated by the people of each hamlet on some hill or rising ground around which their cattle were pasturing. Thither the young folks repaired in the morning, and cut a trench, on the summit of which a seat of turf was formed for the company. And in the middle a pile of wood or other fuel was placed, which of old they kindled with tein-eigin—i.e., forced-fire or need-fire. Although, for many years past, they have been contented with common fire, yet we shall now describe the process, because it will hereafter appear that recourse is still had to the tein-eigin upon extraordinary emergencies. As with Samhainn, Bealltainn seems to have contained a certain element of danger, a threat of the supernatural. To the Welsh, who called it Calan Mai, or Clamme, their equivalent of Bealltainn was one of the ysbryd nosau – “spirit nights”.43 As in Scotland, Ireland, and Man, the communal fires that were lit on the hills served the purpose of purifying and protecting the people and their herds from sickness and misfortune. And like Scotland, Ireland, and Man, the elements of supernatural danger that were perceived to be so prevalent on the day were seen to come from witches or faeries. These charms were then hung in doorways, around the necks of cattle, or tied to their tails, milking and butter-making equipment, to ward off evil influence and disease throughout Ireland and the Highlands and Islands. Rowan woven into the roof was said to protect the house from fire for the year, and when worked into boats it was supposed to provide protection from storms and drowning. 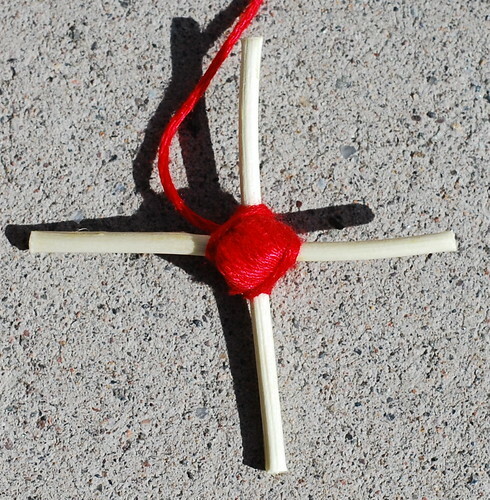 A wand or cross of rowan was also put into the midden, since it was believed that this was a popular place for witches to hide, or else they would try to steal the goodness from it:50 A rich midden signified a rich household, and provided a good source of nutrient-rich compost to add to the fields, so naturally this association made it vulnerable. 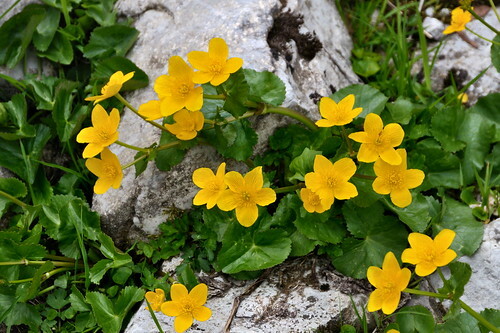 No no details are given as to what flowers were used, they were more than likely the same as those used in Ireland (see below); the fact that the marsh-marigold, which figures significantly in Irish practice, is known as lus-buidhe Bealltainn55 (‘the yellow flower of Bealltainn’) in Scotland indicates the likelihood of it being made use of in Scottish practise as well. Practices associated with water were also a significant feature of Bealltainn festivities and James MacInlay notes that May was the busiest occasion for visiting holy wells, springs or lochs in order to get the benefit of the waters, for healing or for good luck, preferably well before sunrise but.60 At this time the benefits of the water were thought to be at their most powerful, and although many of the wells were considered to be at their most effective on any of the Quarter Days, Bealltainn was perhaps the most popular because of the warmer weather. In some places the wells were not visited until the first Sunday or Monday in May rather than the day of Bealltainn itself,61 but whatever the case there were certain solemn rites associated with approaching it. Generally it was considered vital that the well should be approached in absolute silence, with the person being barefoot and barelegged. On reaching the well, the person walked around it deiseal three times and then silvered it, usually by throwing a silver coin in. After this, they drank from the well whilst contemplating their wish, and then as they left it was traditional to leave a rag, pin or piece of cloth on the nearest tree (which was also considered as having some of the powers associated with the well). In doing this, “he cast off his cares or ills, and anyone who stole or removed a rag fell heir to all the troubles of its original possessor.”62 On top of it all, it was best for the visitor to be far out of sight of the well before the sun came up, but in many areas the vast amount of pilgrims resulted in fairs being held nearby which resulted in much revelry, gossip and drinking that lasted well into the day. The fact that this was said to have taken place on the nearest Christian festival to Bealltainn seems to allow for some shifting from the traditional date to a more acceptably Christian one. 1 Newton, A Handbook of the Scottish Gaelic World, 2000, p181. 2 Evans, Irish Folk Ways, 1957, p272. 3 Evans, Irish Folk Ways, 1957, p272. 4 Newton, A Handbook of the Scottish Gaelic World, 2000, p182. 5 See Carmichael, Carmina Gadelica Volume 1, p191. 6 Stokes, Sanas Cormac (translated by John O’Donovan), 1868, p23. 7 Stokes, Sanas Cormac (translated by John O’Donovan), 1868, p19. 8 See here, for an example. Kinsella gives a more accessible translation in The Táin, p27. 9 Ancient Legends, Mystic Charms, and Superstitions of Ireland, Lady Francesca Speranza Wilde, 1887. 10 Byrne, Irish Kings and High-Kings, 1973, p64-65. 11 Binchy, ‘Fair of Tailtiu and Feast of Tara,’ p128-131; Hutton agrees with his assessment, see note 7, p472 in The Stations of the Sun, 1996. 12 Stokes, Sanas Cormac (translated by John O’Donovan), 1868, p23. 14 MacCulloch, The Religion of the Ancient Celts, 1991, p264. 15 Kelly, Early Irish Farming, p41. 16 Black, The Gaelic Otherworld, 2005, p592. 17 MacCulloch, The Religion of the Ancient Celts, 1991, p264. 18 Patterson, Cattle Lords and Clansmen, 1994, p137. 19 Carmichael, Carmina Gadelica Volume 1, p190. 20 McNeill, The Silver Bough Volume 2, 1959, p55. 21 See Black, The Gaelic Otherworld, 2005, note 132, p593; Carmichael, Carmina Gadelica Volume 4, 1954, p38. 22 See Carmichael, Carmina Gadelica Volume 1, p190-193. 23 Carmichael, Carmina Gadelica, song 365, p337. 24 Pennant, A Tour of Scotland, 1776, p110-11. 25 Stewart, The Popular Superstitions And Festive Amusements of the Highlanders of Scotland, 1823, p259. 26 Frazer, The Golden Bough, 1993, p617-618. See also the 1922 edition. 27 Frazer, The Golden Bough, 1993, p617; see McNeill, The Silver Bough Volume 2, 1959, p55-58. 28 Patterson, Cattle Lords and Clansmen, 1994, p139. 29 McNeill, The Silver Bough Volume 2, 1959, p59. 30 McNeill, The Silver Bough Volume 2, 1959, p60-61. 31 Evans, Irish Folk Ways, 1957, p274. 32 Newton, A Handbook of the Scottish Gaelic World, 2000, p250. 33 See Carmichael, Carmina Gadelica Volume 1, p191. 34 Fergus Kelly, Early Irish Farming, p330. 35 McNeill, The Silver Bough Volume 2, 1959, p68. 36 McNeill, The Silver Bough Volume 2, 1959, p61. 37 MacInlay, Folklore of Scottish Lochs and Springs, 1893, p285. 38 McNeill, The Silver Bough Volume 2, 1959, p73. 39 McNeill, The Silver Bough Volume 2, 1959, p62. 40 McNeill, The Silver Bough Volume 2, 1959, p68. 41 See Festival Bannocks and Caudle for more details. 42 Stewart, The Popular Superstitions And Festive Amusements of the Highlanders of Scotland, 1823, p261-262. 43 Ross, The Folklore of Wales, 2001, p39; See also Hutton, The Stations of the Sun, 1996, p224. 44 Black, The Gaelic Otherworld, 2005, p174-175. 45 Black, The Gaelic Otherworld, 2005, p553. 46 Beith, Healing Threads, 1995, p176-7. 47 McNeill, The Silver Bough Volume 1, 1957, p78. 48 Black, The Gaelic Otherworld, 2005, p177. Tyne means ‘lose’. 49 Polson, Scottish Witchcraft Lore, 1932, p134; McNeill, The Silver Bough Volume 1, 1957, p78. 50 McNeill, The Silver Bough Volume 2, 1959, p62-63. 51 Maclagan, Evil Eye in the Western Highlands, 1902, p119-120; McNeill, The Silver Bough Volume 2, 1959, p63. See also McNeill, The Silver Bough Volume 1, 1957, p82. 52 Dalyell, The Darker Superstitions of Scotland, 1834, p9-10; Newton, A Handbook of the Scottish Gaelic World, 2000, p182. 53 MacInlay, Folklore of Scottish Lochs and Springs, 1893, p299. 54 Napier, Folk Lore, or, Superstitious Beliefs in the West of Scotland Within This Century, 1879, p112. 56 McNeill, The Silver Bough Volume 1, 1957, p84. 57 McNeill, The Silver Bough Volume 1, 1957, p84. 58 Black, The Gaelic Otherworld, 2005, p136-137. 59 Black, The Gaelic Otherworld, 2005, p126;p554. 60 MacInlay, Folklore of Scottish Lochs and Springs, 1893, p297. 61 Dalyell, The Darker Superstitions of Scotland, 1834, p81. 62 McNeill, The Silver Bough Volume 1, 1957, p67. 63 McNeill, The Silver Bough Volume 2, 1959, p65. 64 Napier, Folk Lore, or, Superstitious Beliefs in the West of Scotland Within This Century, 1879, p114. 65 MacInlay, Folklore of Scottish Lochs and Springs, 1893, p299-300. 66 Napier, Folk Lore, or, Superstitious Beliefs in the West of Scotland Within This Century, 1879, p113. 67 Simpkins et al, County Folklore Volume VII: Fife with some notes on Clackmannan and Kinross-shire, 1914, p16.